You don’t know what you may find when searching in an archive. Take, for example, the history of a house and its inhabitants. While looking at the house known as ‘The Laurels’, at the junction of Sim Balk Lane and Church Lane, I discovered that a previous owner had been a Lord Mayor of York. I was surprised because I thought that Councillor John Galvin was the first Bishopthorpe resident to have held that office (2009 – 2010). However, Mr. Galvin’s predecessor was one Alderman Henry Steward who was elected Lord Mayor 140 years ago. Born in York in 1817, Henry Steward was a wealthy comb maker whose grandfather, George Steward, founded the business in the early nineteenth century. The family residence and comb manufactory was in the York parish of Holy Trinity, Micklegate, at 37 Blossom Street. The firm’s principal material was horn which was in plentiful supply in the city. Combs were not the only commodities produced: there were lantern leaves (in the time before glass was used), powder flasks and drinking horns. 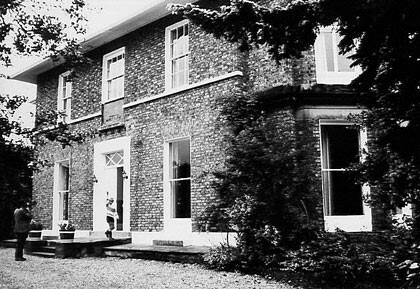 ‘The Laurels’, Sim Balk Lane, photographed in 1963, about 100 years after Henry Steward bought the property. Henry purchased ‘Laurel Villa’, as it was then known, in the early 1860s; his father died there in 1864. The 1871 census reveals that Henry, who was unmarried, lived in the house with his sister, a niece and a modest number of servants. Politically, Henry Steward was, like his father, a Liberal and both served, at different times, as councillors for Micklegate Ward. Henry became an Alderman in 1868 and was straight away elected Sheriff. His first task was to organise the general election in York. Four years later, he took the oath as Lord Mayor and his unmarried sister, Eleanor, became Lady Mayoress. A hectic round of duties was carried out in their year of office. The most prestigious, on the 26 March 1873, was the grand banquet given by the Lord Mayor of London, in that city, for the English and Welsh Mayors. This gathering was aimed at the establishment of a stronger bond between the country’s municipal authorities. They were seeking more control from central government over local affairs and Prime Minister Gladstone, who was present, acknowledged this in his speech. A few months later, Lord Mayor Steward greeted the Lord Mayor of London at York Station, for he had been asked to reciprocate on behalf of the provincial Mayors. Despite London arriving with a splendid entourage, including a group of trumpeters, York was not to be outdone. The long parade through decorated streets to the Mansion House was grand and colourful; the 200 Mayors were resplendent in their gold chains and scarlet robes of office. The banquet at the Guildhall was lavish with numerous toasts and flattering speeches. Illuminations on the Mansion House lit the way to a glittering ball in the Assembly Rooms. Henry was applauded – the event was deemed a great success. Alderman Steward had many strings to his bow. He was a director and trustee of the York Permanent Building Society and chairman of the York Regatta. As chairman of the York Gala Committee, he helped arrange all kinds of entertainments from hot – air balloon ascents to fireworks. However, his greatest interest lay with the cultivation of plants. With the help of his gardener, a variety of flowers and ferns were raised in the greenhouses in the garden at Bishopthorpe. He showed them at flower fetes, especially those held at the Guildhall under the auspices of the Ancient Society of York Florists, of which he was vice-chairman. He won many prizes for variegated pelargonium, feathered rose tulips and scarlet bizarre carnations to name but a few species. Sometimes the Alderman found himself competing against his fellow resident, Archbishop Thomson! However, life as a councillor and Alderman was not all plain sailing for Henry. The many junketing occasions he and his colleagues enjoyed were in sharp contrast to the problems York Corporation faced within an over-crowded city. The sanitary and housing conditions experienced by York citizens throughout most of the 19th century were appalling. The city’s death rates were some of the worst in the country. In the 1850s, even the more affluent property owners of Micklegate Ward, where the Steward family home and manufactory was situated, were castigated as “extremely negligent” in sanitary matters. It was found that the accumulation of “various fluid matters” where there were no public drains or sewers, were left to evaporate in the heat of the sun. Perhaps this was why Henry moved to Bishopthorpe! During Henry’s year as Lord Mayor, the Public Health Act of 1872 was introduced. The new urban sanitary authority took over the functions of the local board of health and the following year a medical officer of health was appointed. Henry did not live to see improvements to the sanitary conditions and public health of the city; these did not begin to take effect until the 1880s. Henry Steward died on the 15th December 1876, following a long illness. His funeral was reported in some detail in the local press. The mourning coaches made slow progress in heavy rain from Sim Balk Lane to York Cemetery where he was buried in the family grave. ‘Laurel Villa’ was bequeathed to his sister Eleanor who lived there until her own death in 1895. Despite the burial in York, Eleanor was keen to see that her brother was remembered in Bishopthorpe. She erected a monument to him in St. Andrew’s Church which joined another dedicated to their parents and other family members. The engraved marble memorials, which would have been moved from the old church to the present one in 1899, can still be seen high up on the wall of the bell tower. So Bishopthorpe’s first Lord Mayor of York is not entirely forgotten. As I said above, it’s surprising what you may find in an archive – especially the Bishopthorpe Community Archive. Open on Mondays, 2.30 – 5.00 pm upstairs in the Village Hall. W. Knowles, Lord Mayors of York, Scrap Books, Vols. 9 & 10. Manuscript notes transcribed by Jill Murray. On open shelves at Explore York Library. J. Malden, ‘Combmakers of York’ in, York Historian Vol. 8, 1988, p50. M. Tillott (ed. ), A History of Yorkshire: The City of York, [O.U.P., 1961] pp 281 – 6. The will of George Steward, proved at York 11 November 1864. The will of Henry Steward, proved at York 5 March 1877.